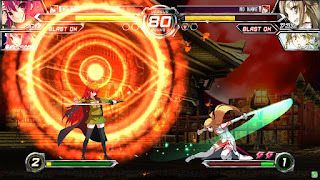 It's not often Animé based games hit the expectations of fans, so how did Dengeki Bunko: Fighting Climax do and is it something any Animé fan should rush out to get? Read on as I express my views as both a fan of fighting games and Animé. 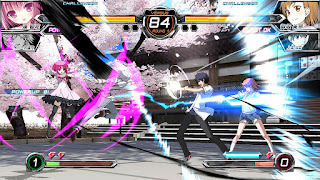 For those who haven't heard of Dengeki Bunko: Fighting Climax, this game is a 2D brawler, much like Street Fighter (or the more recent Persona 4 Arena: Ultimax) where you choose your character, have a set amount of combos unique to that character and are then tasked to battle your way through the game. It's fairly standard and works like any other fighting game, with the only exception being that this game has many characters from loved and well known Animé series. Ever wanted to play as Kirito from Sword Art Online? Well, he's here along with his love interest Asuna. 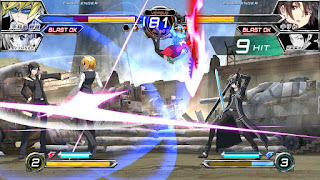 Both are playable (with Leafa also here as a support character), along with the likes of Shizuo Heiwajima (Durarara!!) and Kuroyukihime (Black Lotus from Accel World) which is nice. The main issue I have with the game however is that there are a lot more assist characters than playable ones, and I can't help but question the logic behind this. Initially there are around nine characters to choose from and once you've played through the game enough, you'll have unlocked a few more, eventually taking you up to the 14 playable characters the game has to offer. Although this isn't bad, several of the assist characters would have served better as main playable characters. Now I'm not saying this due to the way they assist you, but more so in the sense that this game is clearly a game made for fan service and yet the characters most fans love are only available as assists. A good example of this is Kuroyukihime. Accel World is one of my all time favourite Animés and as happy as I was to see her playable, she's only playable in her fairy typed costume, with attacks that throw out ghostly illusions of her Black Lotus form. Why not let us play as Black Lotus? Kuroyukihime isn't a fighting character, but her Black Lotus avatar is and so it'd make more sense to play as Black Lotus. The other issue I have with this is that Taku (the main protagonist from Accel World) is just an assist. You can call him in to do a little damage in his Silver Crow avatar form, but I mean come on, we can't even play as the main protagonist of the show both he and Kuroyukihime are from. To further add to this, Shizuo (Durarara!!) is playable, but once again his arch-rival Izaya Orihara is simply just an assist character. I can speak for many fans here when I say the developers ignored a great opportunity to give fans some epic fights of rivalry that would have been great to play. All of this is a shame, because visually the game is quite appealing. Each 2D character sprite has an old school feel, reminding me of the animations and visuals from the likes of Marvel vs Capcom 1/2 and King of Fighters. You know, the good old school fighting games. While these characters are pretty great to look at, SEGA are the ones who published the game and as such, most of the in-game arenas are all based on past SEGA games and not those of the Animé characters featured within the game. The music isn't bad and the game itself can be fun, but it lacks the quality of most fighting games that came before it. Marvel vs Capcom 2 is an old game now, but even that had a lot more going for it. I guess part of the issue here is that Dengeki Bunko doesn't really know what it wants to be, simply because it tries to do too much. Is it an Animé game? Yes. Is it a SEGA game? No, but it is published by SEGA. It would have been great seeing stages ripped from each of the Animé titles the characters came from, and perhaps the developers wanted this, but instead we're just left with stages from the liked of Shinobi, Sonic the Hedgehog and Virtua Fighter. It doesn't make a whole lot of sense to me. 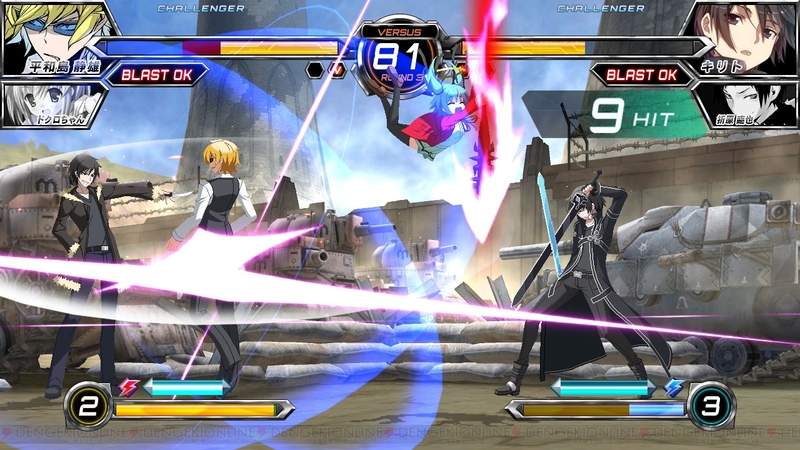 Moving onto the gameplay itself, each playable character has their own unique set of moves. Some I feel play better than others (with Kirito being one of the more relentless characters), but it's hard to say whether every character is balanced and when you hit start to load up the command list, there's actually only very few moves to use for each character. As such, the game itself feels pretty basic. 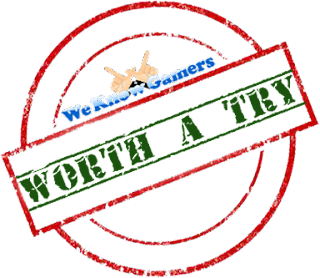 What;s worth mentioning here is that button basher's will probably get more enjoyment out of this than the more calculative or methodical types who like to read and counter their opponents moves. Each character has two ultimate moves to choose from and using your assist characters attacks as distractions can be good bait for forcing your opponent to reveal an opening in their defense. 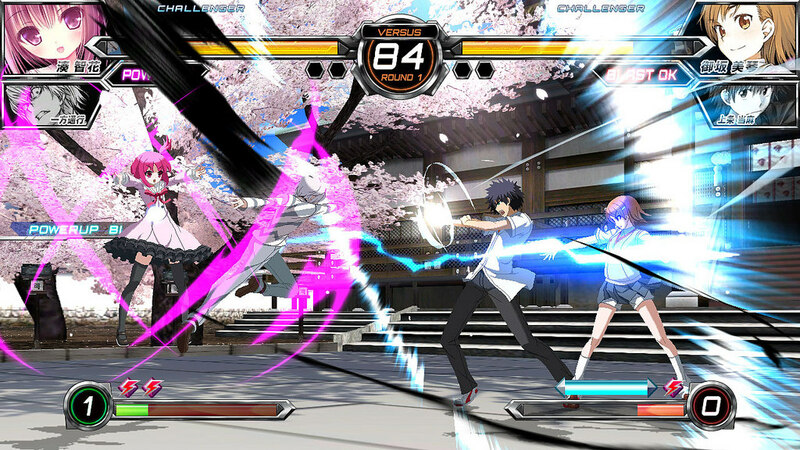 The issue I found however is that when progressing through Arcade Mode (Bunko's story mode), you can win fights generally quite easily by keeping your opponent the other side of the screen, alternating between assists and your own long ranged attacks. Oddly enough though, this makes for a lot of easy battles, so it ends up being a lot more fun when you don't play strategically and just run at your opponent with everything you've got. There are multiple game modes, but none seem all that exhilarating. Story mode offers two options - Arcade and Dream Duel. As mentioned above, Arcade is the main story mode of the game. This is the mode where you most frequently unlock characters and get to hear/read a little bit of speech from your chosen character and the opponents you come to face, where as Dream Duel allows you to choose your favourite character and pit them against another contender you want to face. Both modes seem incredibly shallow and out of the two, I'd say Dream Duel is ever so slightly better, only because the characters seem to express more personality in their one sentence or so of dialogue. The main story can be summarised in one sentence however; "I created this dream by consuming you all, and now the strongest of you must defeat me". Dengeki Bunko: Fighting Climax features VS Mode, both on and offline, along with a challenge mode (where you must fight under certain circumstances), a training mode to practice and finally customise and special options. The latter two options allow you to customise the colour scheme of your characters by purchasing them with points earned through playing, along with your own call card which allows for you to add your own picture and call sign, but sadly this is very basic. The special option just shows what you've unlocked, such as character art and background music. Overall, I feel with a bit more effort and better design choices, Dengeko Bunko: Fighting Climax could have been a lot more enjoyable, but with so many issues that could have been somewhat easily rectified, it just ends up falling fairly flat on its face. As a massive fan of Animé myself, I feel this is a real shame, because it's not a bad game. It's just not a great game either.